Over a million dollars of testing for various genetic markers led us to the most prevalent mark in our lives: the question mark. 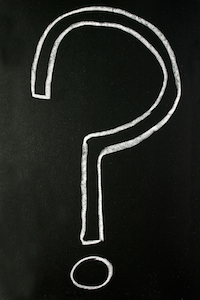 The question mark is a universal symbol of uncertainty, a reminder of the need for more information. It punctuates every aspect of our experience with congenital fiber-type disproportion myopathy. Congenital fiber-type disproportion (CFTD) myopathy is rare. In fact, it is so rare that there are no estimates on just how rare it is. A neuromuscular condition, it affects the muscle fibers and causes weakness that can affect eating, breathing, mobility and posture. Besides my sister and my son, I have never met another person with this debilitating condition. Some of my early questions related to this rare condition were answered through my sister’s experiences. What is this condition and what limitations does it create? How does it affect the quality of life? What type of research is being conducted, and how near are we to an effective treatment? These questions are directed outward, but many more are deeply personal and agonizing. Very few research dollars go toward congenital fiber-type disproportion myopathy, as it is a lesser-known neuromuscular disease compared to its famous relatives, Spinal Muscular Atrophy, ALS, and Duchenne Muscular Dystrophy. Because none of our son’s physicians have ever treated a patient with this condition, my role is often to answer their questions and advocate for treatments that consider the full gamut of ways this condition affects our son’s life. The orthopedic treatments cannot interfere with the respiratory plan, and so on, but which should be prioritized and for how long? For a condition so rare, the uncertainties abound and the answers are few. I suspect that regardless of our children’s unique concoctions of cells and data, our questions are similar. Will this condition shorten my son’s life as it did my sister’s? If we have more children, will they be born with this condition? Will our son ever be able to get rid of the trach? Will people see past his disability to discover the awesome person he is? Will he understand that his life is meaningful and valuable? Will he be able to live independently? Will his life be happy and fulfilling, despite all the challenges? I find myself becoming more adept at responding to the many questions I am asked, and educating specialists, teachers and therapists about this rare condition is a necessary part of raising a child with a rare condition. In some ways, I feel like a wealth of information, a veritable encyclopedia of CFTD myopathy facts and figures. However, I know there are many things that are yet to be known, many gaps in knowledge that need to be filled. My hope is that one day, the answers will outnumber the questions. Charisse Montgomery, author of Home Care CEO: A Parent’s Guide to Managing In-Home Pediatric Nursing, is a professional writer, editor, wife and disabilities advocate, in addition to her most important role as mama to Richie. Having lost her sister to fiber-type disproportion myopathy in 2012, she advocates on behalf of her son and in memory of her sister. She has a bachelor’s degree in English from Towson University and master’s degrees in English and Educational Psychology from The University of Toledo, with research focused on empowering parents with medically disabled children. She recently completed a graduate certificate in Patient Advocacy, and she serves on the Lucas County Board of Developmental Disabilities. She can be reached at @madvocator on Twitter, Facebook and Pinterest or through her personal blog site, madvocator.com.